SINGAPORE - More companies here are putting in the money and effort to spruce up their offices with fun designs and playful elements beyond the typical drab and grey cubicles, in the hope that this will keep staff happy and motivated. Here is a look at 5 workplaces that are possibly ‘cool’ enough for you to stay past knocking-off time. Energy recruitment specialist Spencer Ogden’s Asia-Pacific headquarters in Eu Tong Sen Street boasts Astroturf flooring, reclaimed wood round tables, and American-style diners. It is also home to a large, bronze gong - which employees hit by way of celebrating each time they clinch a deal. Need a nap while at work? This is not taboo at SAP Singapore, which sells and develops business management software. Employees can catch forty winks in a sleep pod – a reclining sofa fitted with a helmet-like dome for privacy. It is painted black on the inside, and comes with built-in audio speakers. “The pod is imported from overseas and designed for power napping at work, to help employees recharge, manage stress and increase productivity,” managing director Kowshik Sriman told The New Paper. SAP’s office at the Mapletree Business City in Pasir Panjang also features cosy corners, or sitting rooms, with swing-like seats suspended from the ceiling. There is even a foot-reflexology path to rejuvenate tired feet. Search engine giant Google has come a long way since its humble beginnings in a dorm room and a garage. Hammocks hang from one part of its Asia-Pacific headquarters in Asia Square, where employees can find a quiet spot to work. There is a tuk-tuk meeting room, where a real tuk-tuk has been converted into a small meeting spot with the addition of a table, as well as a game room for staff to unwind - complete with a pool table, a ping pong table, and foosball. To encourage its employees to make healthy eating choices, Google Singapore provides organic breakfasts, lunches and to-go dinners free of charge at its well-stocked pantries and cafeterias, including one that resembles a Peranakan shophouse. Employees at marketing and consulting agency SapientNitro often flock to its two outdoor garden terraces for a breath of fresh air. Decked with vertical greenery and hanging foliage, the garden terraces, used for casual meetings as well as company events and celebrations, also feature an in-built bar area. “It helps give the office a sense of calm and also allows for breakout sessions and team bonding activities amidst a peaceful setting – all the better to inspire creativity,” said Mr Kim Douglas, vice-president and managing director for the firm’s Singapore and Hong Kong operations. Meeting rooms at the office in Cecil Street are also lined with glass walls and whiteboard spaces, which are designed for conducive brainstorming sessions and effective visual conceptualising. What is a day at Spotify without music? The commercial music streaming service’s office at Boat Quay comes with several Spotify Connect devices, where staff can share their playlists through the in-room speakers. 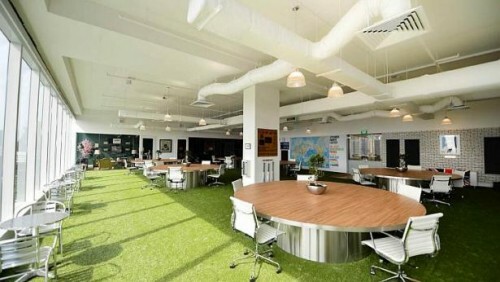 Its open-concept office space also features adjustable standing desks and chill-out areas with bean bags. “Our ‘play everywhere’ concept allows us to become more productive and our office space is designed to help us to do exactly that,” said Ms Sunita Kaur, managing director (Asia).